While I enjoy reading comics, there’s lots of comics spin-off media I like as well: the Marvel Cinematic Universe; the “Peanuts” animated specials; the Lego Marvel/Batman video games; etc. In some cases, there’s characters I enjoy more in these non-comic versions than the “core”/canonical comics. Here’s a list of some comic characters that fit this. 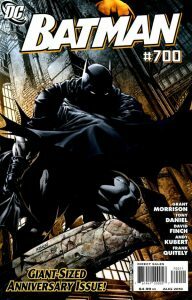 “Batman” #700 (August 2010). Art by David Finch. For years, longtime followers of me online probably know of my immense dislike of the modern comics’ Dark Knight. However, I specify “modern comics” for a reason. 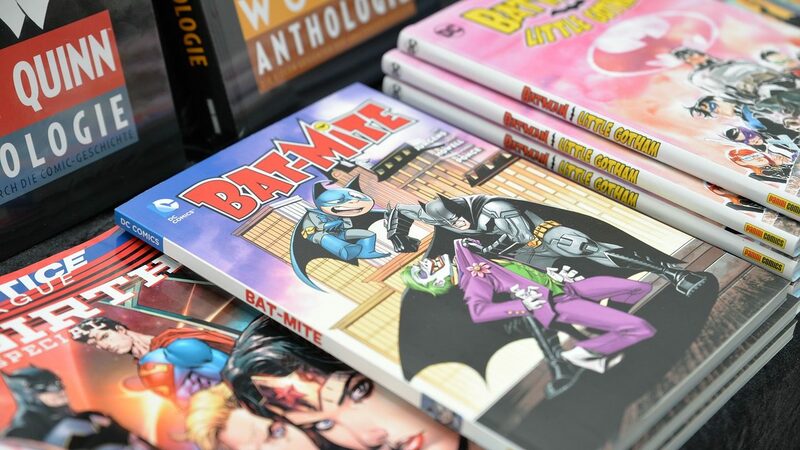 I’ve enjoyed different versions of Batman—I’ve bought the various Lego Batman video games; enjoyed the movie of that same name; enjoyed “Batman: The Animated Series” and the Adam West “Batman” series; and enjoy reading the older Batman comics. The modern stories are excessively grim, dark, and violent, to the point of feeling nihilistic. Gotham seems to be “murderville” and economically depressed, despite the efforts of its resident superhero and his alter-ego’s vast billions (and literally owning half the city). On top of that, if the Joker’s already slaughtered, say, a church full of Black people (per a 2018 story) before Batman shows up, what’s the point of the story? Or of Batman as a superhero, if the people of Gotham aren’t safe even going to church? As I wrote in an earlier post, Batman in modern comics is pretty much an unlikable character. He has the personality of a microwave, is constantly brooding/frowning, has no real interests (outside of crime-fighting), and treats even allies with contempt (see: secret plans without their permission to take them down). Granted, Batman’s tactical and planning skills are famous (plus, well, his wealth). But other than that, I don’t see any reason he deserves any respect by other heroes (especially given the aforementioned state of his city above)—if anything, they should tell Mr. “this is my city” to go pound sand. In general, “hero” isn’t exactly the word that crosses my mind to describe this version of Bruce Wayne. Finally, some of the elements in the current comics are probably feeling dated or problematic. Part of this is simply the result of the fact the character turns 80 years old this year. But other problems are probably tied to how slavishly dedicated DC is to Frank Miller and his 1980s series “The Dark Knight Returns.” That’s been over 30 years ago, yet it’s left a very deep mark on almost every version of Batman to date. Never mind Miller himself has since been shown to be problematic (anti-Muslim views, etc.). Other stories also feel like they’ve cast a similarly influential yet problematic and dated tone (“The Killing Joke,” etc.). There’s also various real life changes since the 1980s. For instance, Gotham feels stuck in the popular media view of 70s/80s-era New York as a “cesspool” with major problems; however, the real New York (which Gotham’s a pastiche of) has since vastly changed and improved. Mental health treatment attitudes have also changed over the decades, which might make Arkham Asylum as a concept problematic in the future. Additionally, there’s much more criticism now versus the 80s of “tough on crime” policies; such policies tend to disproportionately harm Blacks and Latinos. An angry rich White guy declaring a “war on crime” conveys a different tone these days. Overall, I think it’s a combination of the above three issues that makes Batman’s current comics unappealing. However, said elements are either not used or addressed differently in comic spin-off media (and older comics), which is why I find those more enjoyable: Batman might be likable and not a jerk; Gotham might be shown as a more believable city (or actually benefit from Batman/Bruce Wayne’s presence), versus an economically depressed “murderville”; the violence might be toned down to “not trying to one-up the six o’clock news” levels. Thus, I’ll stick with the media spin-offs, some of which are, well, actually fun. If I want to read about an angry rich guy with a toxic personality, who’s saddled with dated elements, and is bad at his job, I’ve got the news for that. 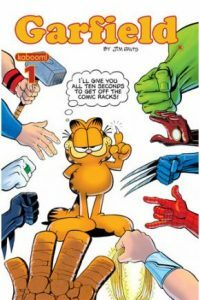 While I always enjoyed the “Garfield” comic strip as a kid, it’s since become not the most exciting strip to read. After the 80s, the comic strip dropped some of the earlier characters, recurring stories, etc., leaving a lot of mostly banal entries. Things actually improved once Jon and Liz started steadily dating, but “Garfield” the newspaper strip still isn’t exactly comparable to my favorite webcomics. Meanwhile, I greatly enjoyed “Garfield and Friends” in the 90s, as well as the various animated primetime specials. “Garfield’s Halloween Adventure” and “A Garfield Christmas” are still on my must-see list for annual holiday viewing. The modern CGI animated efforts are admittedly more hit and miss, though. The comic book has also been more enjoyable than the strip, from what I’ve read. The X-Men are entertaining enough as comic characters. However, I’ve mostly enjoyed them through their animated and live-action movie versions, plus various video games. The first point’s been mitigated by Marvel Unlimited and trade paperbacks, plus the solo titles for some heroes like Storm and Iceman. However, it’s still easier to just rewatch the 90s “X-Men” animated spin-off of the comic. “Richie Rich” #254 (January 1991). I wasn’t a big reader of Richie Rich’s comics. Though that’s not a slight against Harvey Comics; the publisher during my childhood either had a greatly diminished presence or was defunct. But I did enjoy the 1980s Hanna-Barbera animated series starring Richie. In retrospect, it’s certainly a product of its era. Gloria would be written as more assertive (and less of a passive sidekick) nowadays. Dollar was also occasionally annoying. 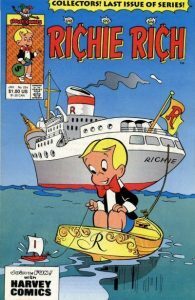 The short-lived “Richie Rich” comic revival a few years ago gave an idea of what a modernized version of Richie and the gang could be like. Eclipso was never a favorite comic villain of mine. Everything about him feels either generic (his powers, his motivations, his Smurfs-meet-Green Goblin-esque costume, etc.) or trying too hard (“of course he’s capable of going up against the Spectre! Really!”). However, the “DC Super Hero Girls” animated series of comic spin-off shorts made Eclipso reasonably entertaining. There, Eclipso (a woman in this series) has decent enough motivations; she also has ties to another DC concept, Gemworld (no relation to “Steven Universe”).